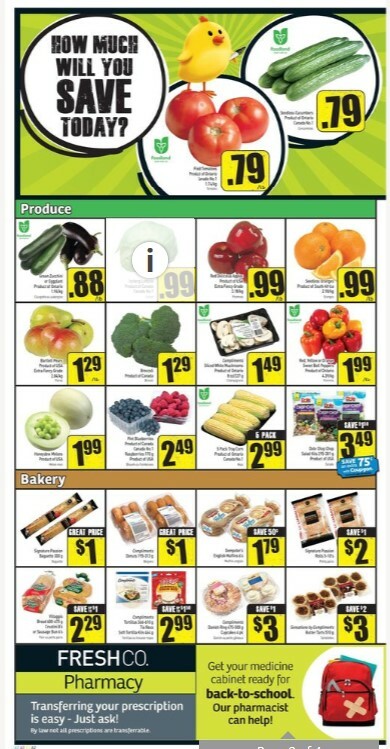 FreshCo Supermarket Flyer valid Aug 17 - 23, 2017. 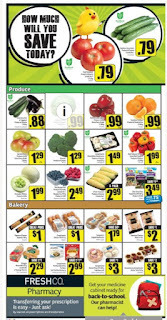 Get savings for prices fresh produce, meat, bakery, deli, grocery, seafood, halal that will be on sale at FreshCo Supermarket stores this week. Bartlett Pears -- On Price $1.29/lb Product of USA extra fancy grade $2.84/kg. Broccoli -- On Price $1.29 Product of Canada. Tray Corn -- On Price $2.99 5 pack. Product of Ontario Canada no. 1. Dole Chop Chop Salad Kits -- On Price $3.49 $1.50 Savings 295-301 g product of USA. Save $0.75 an extra with coupgon. See back page for details. Bakery flyer such as Villaggio Bread Crustini or Sausage Bun - Price $2.29 save Up to $1.00 Village bread 600-675 g crustini or sausage bun 6's. Compliments Tortillas Tia Rosa Soft Tortilla Kits - Price $2.99 Up to $1.50 Savings Compliments tortillas 366-610 g tia rosa soft tortilla kits 464 g. and Compliments Danish Ring Cupcakes - Price $3.00 $1.00 Savings Compliments danish ring 475-500 g cupcakes 4 pk. And also find Sensations By Compliments Butter Tarts - Price $3.00 Savings $2.00 510 g.
Lake Erie White Perch Fillets $4.99/lb # Now Price $1.50 Savings $11.00/kg. Go Basa Fillets Frozen or Marinated Herb& Garlic Shrimp $7.00 # Now Price Go basa fillets frozen 1.13 kg or marinated herb & garlic shrimp frozen 340 g.
Mina Halal Chicken Bologna, Breakfast Strips or Wieners $2.49 # Now Price Up to $2.50 Savings 375-500 g.
Tandoori Oven Tandoori Marinated Chicken Leg Quarters $7.00 # Now Price $1.00 Savings 1.025 kg.